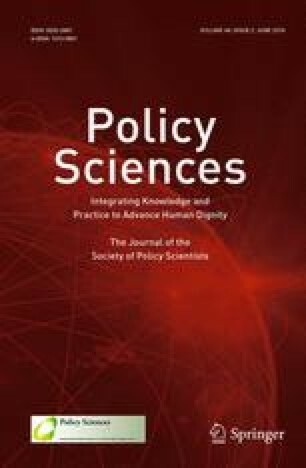 Earlier versions of this article—including the first version, entitled “Policy Anti-Bubbles”—were presented at the workshop on “Financial, Technological, Social and Political Bubbles,” ETH Risk Center, Zurich, 2015; the Biennial ECPR Standing Group for Regulatory Governance Conference, 2014; the Annual Meeting of the Midwest Political Science Association, 2014; the Institute of Political Science, University of Heidelberg, 2014, and the International Workshop on “Policy Design and Governance Failures,” Lee Kuan Yew School of Public Policy, National University of Singapore, 2014. I thank the audiences of these events for useful comments and suggestions. I also thank the anonymous reviewers for their comments on the manuscript. All remaining errors are my own. Bénabou, R. (2011). Groupthink: Collective delusions in organizations and markets. Working Paper. http://www.nber.org/papers/w14764.pdf. Accessed 17 December 2014. Perez, T. L., & Dionisopoulos, G. N. (2014). Presidential Silence, C. Everett Koop, and the surgeon general’s report on AIDS. Communication Studies, doi: 10.1080/10510979509368436. Sornette, D., & Cauwels, P. (2014). Financial bubbles: Mechanisms and diagnostics. http://arxiv.org/abs/1404.2140. Accessed 17 December 2014.